Col. Christopher Spinelli, 412th Operations Group commander (left), passes the 416th Flight Test Squadron guidon to Lt. Col. Scott Fann during a change of command ceremony June 1, 2017, in Hangar 1207. Fann takes over the squadron from Lt. Col. Chris Keithley (right) who commanded the squadron for the past two years. 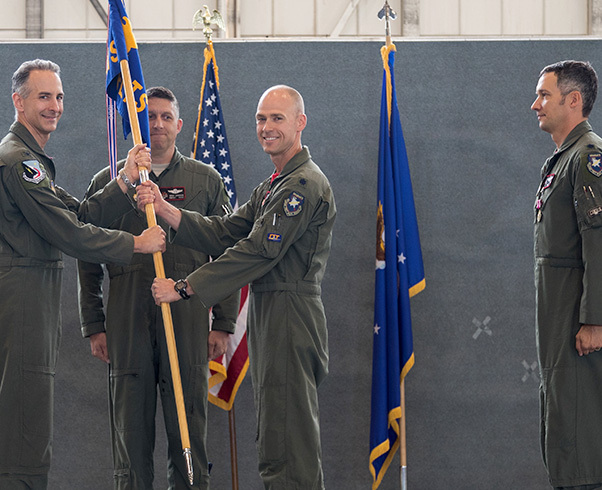 Col. Christopher Spinelli, 412th Operations Group commander, handed the 416th Flight Test Squadron guidon to Lt. Col. Scott Fann during a change of command ceremony June 1 in Hangar 1207 at Edwards Air Force Base, Calif.
Fann takes over from Lt. Col. Chris Keithley. 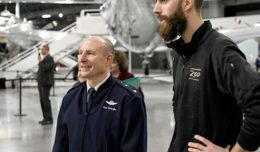 Fann was previously the deputy commander of the 412th Operations Group, which conducts developmental test and evaluation of nearly every aircraft, including its associated weapons, in the Air Force inventory and several joint prototype aircraft. As commander of the 416th FLTS, Fann oversees developmental test and evaluation at Edwards AFB for the F-16 Fighting Falcon. 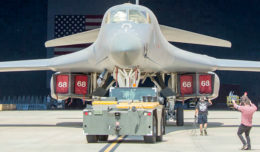 The squadron conducts program management, flight operations and test engineering for the Global Power Combined Test Force, overseeing the continuous modernization of the F-16. Additionally, the 416th FLTS provides training for other squadrons around the Air Force in high angle of attack departure recognition, avoidance and recoveries. Fann attended the U.S. Air Force Test Pilot School and was an experimental test pilot and flight examiner in the F-16, Blocks 25-52.